As any dental hygienist will warn you, plaque is durable stuff. It traps bits of food, bacteria, and pathogens on your teeth, and if you don’t brush or floss regularly, it sticks there—for good. That might be bad news for you, but it’s good news for archaeologists. 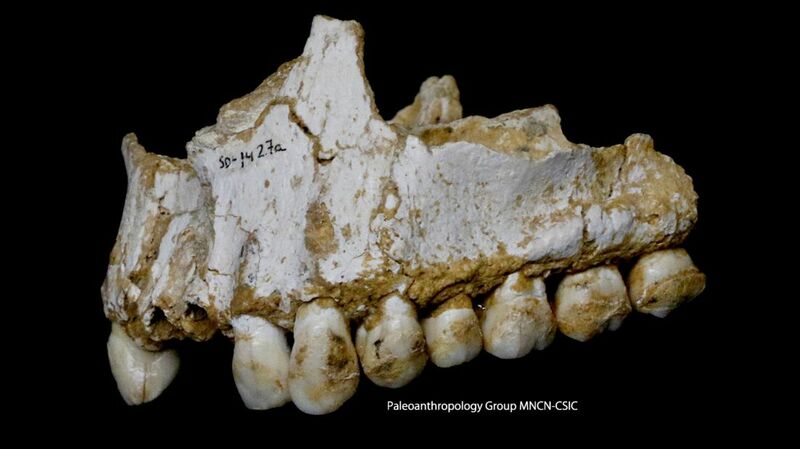 Fossilized plaque, also known as dental calculus, has been found on corpses that are tens of thousands of years old. Now that scientists have the tools to analyze old plaque for pieces of ancient DNA, they can reconstruct the diet, health, and lifestyle of the dead. One team recently looked at the fossilized plaque on the teeth of four Neanderthals found at two cave sites: Spy in Belgium and El Sidrón in Spain. As our closest known relatives, Neanderthals had a lot in common with modern humans before they went extinct. They built tools and lit campfires. They may have decorated their bodies and buried their dead. And, according to a new study published today in Nature, they took medicine for pain and natural antibiotics for infections, and at least some of them had a plant-heavy diet. At 42,000 to 50,000 years old, these samples represent the oldest dental plaque ever to be genetically analyzed. One of the individuals found at El Sidrón suffered from a dental abscess visible on the jawbone. He also had an intestinal parasite. That may be why he was consuming poplar—which contains pain-killing salicylic acid, the active ingredient of aspirin—as well as a natural antibiotic mold, Penicillium. Previous research had shown that Sidrón Neanderthals may have used yarrow, an astringent, and camomile, a natural anti-inflammatory, as medicinal plants. In addition to new insights on the medical regimen of Neanderthals, the study revealed regional differences in Neanderthal eating habits. As ACAD research fellow and lead author Laura Weyrich and her colleagues found, the menu at El Sidrón consisted largely of plant-based foods, like mushrooms, pine nuts, and moss. Meanwhile, at Spy cave, Neanderthals ate a lot of meat, including woolly rhinoceros and wild sheep. This difference in diet also seemed linked to a difference in oral bacteria between these two Neanderthal populations, which implies that meat consumption contributed to changes within the microbiome for Neanderthals. "The differences in the oral microbiome are important, because they tell us something about how the human microbiome began to change," Weyrich tells mental_floss. "We know today that historic changes in the human microbiome have likely resulted in the issues we now have with modern human health and altered microbiomes. We need to understand these changes in the past in order to understand how we obtained the bacteria that we now have with us today." Christina Warinner, an expert on ancient DNA at the Max Planck Institute for the Science of Human History in Germany, tells mental_floss that the most important aspect of the study is the recovery of ancient microbial DNA. “This provides our first direct evidence of oral microbial ecology in an archaic human,” says Warinner, who wasn't involved in the new study. Indeed, the researchers were able to reconstruct nearly the complete genome of the mouth-dwelling microbe they found, Methanobrevibacter oralis. At 48,000 years old, it is the oldest draft microbial genome created to date. Warinner says she has consistently found members of this genus to be more common in the past than today. Hundreds of thousands of microbes live in or on the human body, and scientists are just starting to understand how these organisms affect everything from mood to allergies. Warinner suspects Methanobrevibacter microbes once played a much larger role in the human oral ecosystem than they do today, but scientists know little about the past and present function of these organisms. “It is an important reminder of how we've really just scratched the surface of the human microbiome, and how much work there is to do to understand the evolution and ecology of this fundamental part of our human biology,” Warinner says.